Pilot Gabrielle Adelman and Photographer Kenneth Adelman prepare to depart for Point Reyes. We've flown over most of the California coastline before and have seen the beauty of the natural coastline and destruction that man has wrought unto it. 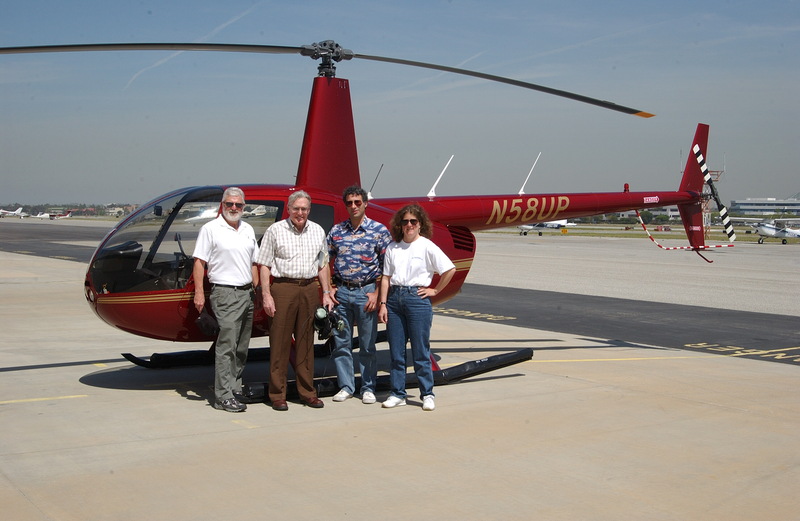 In 1997 we volunteered the use of our helicopter to the Sierra Club. It wasn't long before Mark Massara called us asking for our help working with Gary Lynch, an established environmental photographer from Cambria, to document San Simeon Point for the fight against a huge resort and golf course that the Hearst Corporation wants to build. Our mission and the fight against this development was successful, and from time-to-time over the years we have volunteered our time and resources to help protect the coast. We've been called to photograph "after" pictures of illegal activity that has destroyed the coast, but rarely do we have the "before" pictures. More than once we wished we'd used the opportunity to photograph a "before" picture. The advent of modern digital cameras with resolution in the 6 megapixel range helped make the decision to forgo film and photograph the coast digitally. A Nikon D1x with a 28-70mm f/2.8 ED-IF AF-S Zoom-Nikkor lens was used to take these pictures. In order to sustain the high frame rate and still shoot at maximum resolution, the camera was tethered with a FireWire cable to a 667Mhz Apple Powerbook (since upgraded to a 1Ghz model) running MacOS 9.2.2 and the Nikon Capture 2.0 software. The Nikon D1x is also connected to the aircraft GPS receiver using a custom-made cable, thereby recording the latitude, longitude, and altitude of the helicopter in each image file. The Powerbook has a 60GB hard drive (since upgraded to 100GB), enough to hold a full day of shooting. In the evening, the image files are transfered via FireWire to an external drive for permanent storage. The camera is powered by a small AC inverter and the computer is powered by a special "cigarette lighter" adapter that can handle the helicopter's 24V DC electrical system. The images are stored in Nikon's proprietary NEF format, and later converted into JPEG using Nikon Capture running on a Power Mac G4 with dual 1Ghz processors. The GPS position is extracted from these files and used to build a sequential index of the photographs that is used to navigate the coast on this website. The smaller preview and thumbnail images are produced from the larger images using Photoshop. It takes approximately four days of post-processing to generate the images and index you see from one day of shooting. The higher resolution NEF format files are not available online, but they, or TIFF format files, could be made available for applications requiring the detail which is lost in the JPEG compression. We have been very happy with the performance of the camera and computer we are using. Together, they allow us a sustained frame rate of a frame approximately every three seconds, without pause, all day long. In October 2005 we replaced the Nikon D1x camera with a 12.4 megapixel Nikon D2x. The Nikon D2x has much higher resolution and the image files are correspondingly larger, but the USB connection is not correspondingly faster. The Nikon D2x isn't able to photograph fast enough when tethered to a computer, but it is able to photograph fast enough when storing compressed-NEF files directly to a Lexar 40GB 80X flash card. By using a Lexar high-speed card reader connected to our Apple PowerBook, we're able to read one card while the camera is writing another. We stop briefly every 17 minutes to swap cards. The audio-output of the PowerBook is connected to the helicopter's audio system, and a special script on the Apple uses MacOS's built-in speech synthesizer to assure us that the card has been read correctly prior to it being recycled. The Nikon D2x is an impressive instrument, but the Nikon software does not match the quality of the hardware. We're used Bibble Pro to do all of the post-photography image processing. We had already completed most of our 2005 work using the Nikon D1x, but switched mid-year to the D2x. The difference in resolution is stunning. 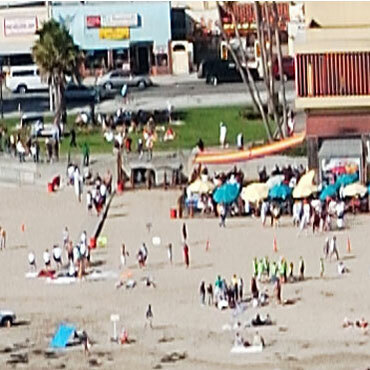 These samples show a crop-and-enlarge from a series of test photographs taken with the two cameras side-by-side of the Santa Cruz Beach Boardwalk. In the spring of 2009 we replaced the Nikon D2x camera with a 24.5 megapixel D3x. Although the D3x has more pixels, there isn't a substantial increase in the resolution, leading us to believe that the atmosphere or the movement of the helicopter might be the limiting factors. The D3x, however, can cycle a lot faster than the D2x, allowing us to fly the helicopter much closer to its normal cruise speed as compared to the 40-60 kts that our original D1x required. This allows us to cover a lot more ground in one day. The Nikon D3x also has a wider sensor (FX format as opposed to DX format), but Nikon doesn't make a suitable longer-focal length lens to match. As a result, we try to fly closer to our subject, which changes the style of the photography slightly, but results in more detailed photographs. In 2013 we replaced the Nikon D3x camera with a 36.3 megapixel D800E. The increase in the number of pixels didn't substantially change the resolution of the photographs, but once again, the D800E can cycle even faster than the D3x, allowing us finally to photograph at our helicopter's normal cruise speed. In 2015 we replaced the Nikon D800E camera with a D810. The D810 has improved noise and over the D800E, and gives us more latitude when working in the few areas of the coast that are under shadow in the afternoons. 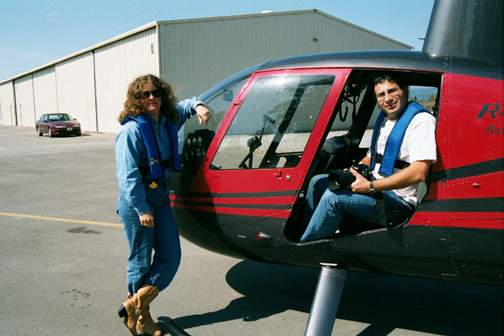 These photographs were taken from a Robinson R44, flown by my wife, Gabrielle Adelman. The helicopter was flown southeast-bound along the coast at altitudes ranging from 150 to 2000ft, but typically 500-700ft, depending on the terrain, detail, and air traffic control constraints. The port-side rear door was removed, giving the photographer an unobstructed view of the coast. The camera was hand-held to allow the photographer to correct for motion of the helicopter. The image frames are approximately half-overlapping, meaning the shutter was depressed when the image had moved halfway across the viewfinder. For various reasons, we made more than one pass over certain areas. A sort algorithm is applied to the data to merge the photographs from multiple passes into a continuous coastline. In April 2005 we replaced our old R44 Astro with an R44 Clipper II. The Clipper has "pop-out" floats that can be deployed in an emergency, permitting a safe landing on water. 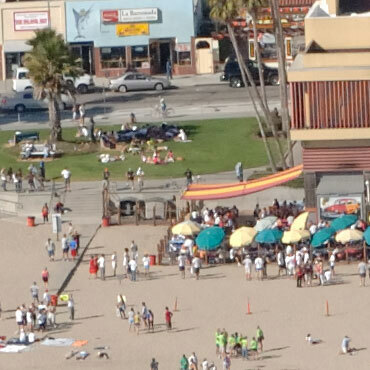 The vantage point of a helicopter offshore at 500 feet provides spectacular views, and is nearly ideal for documenting the development of the coast. This project was not intended to be art for art's sake; it is intended to create a permanent record of the California coastline. A purely artistic approach could have omitted large areas and would have required seeking ideal lighting for each area. The permanent record approach requires that nothing be missed and sometimes trades off the quality of individual images. The view that we have chosen varies from area to area, depending on the level of development and the contour of the terrain. In some areas, we have covered them more than once at different altitudes and distances. This project will never be complete. We hope to photograph the area around the Vandenberg AFB as soon as possible. We will re-photograph portions of the coastline every few years, so that historical data is available for research and enforcement purposes.